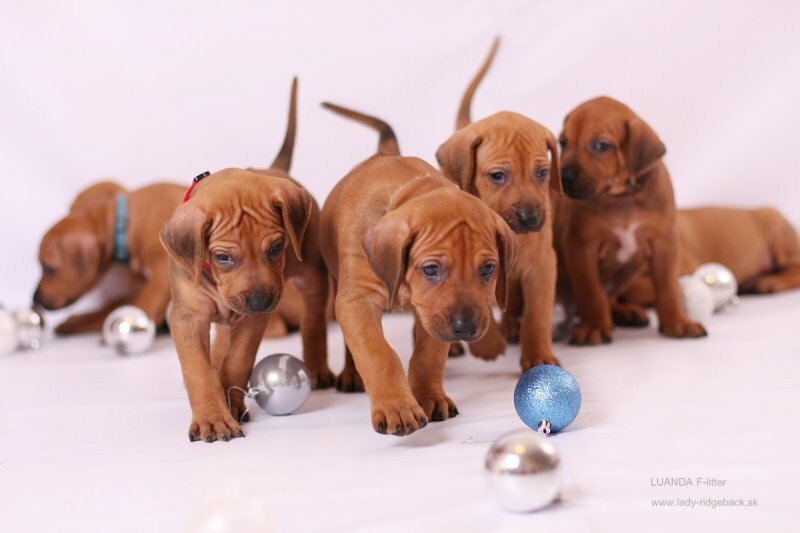 24.12.2014 - our C-litter 4years old! 4years ago we had a very bussy Christmas time ! Our C-litter came to the world! HAPPY BIRTHDAY my dear puppies !!! Lots of love, health and happy days with your wonderful families !!! Merry Christmas to all our friends and visitors ! Šťastné Vianoce všetkým !!! 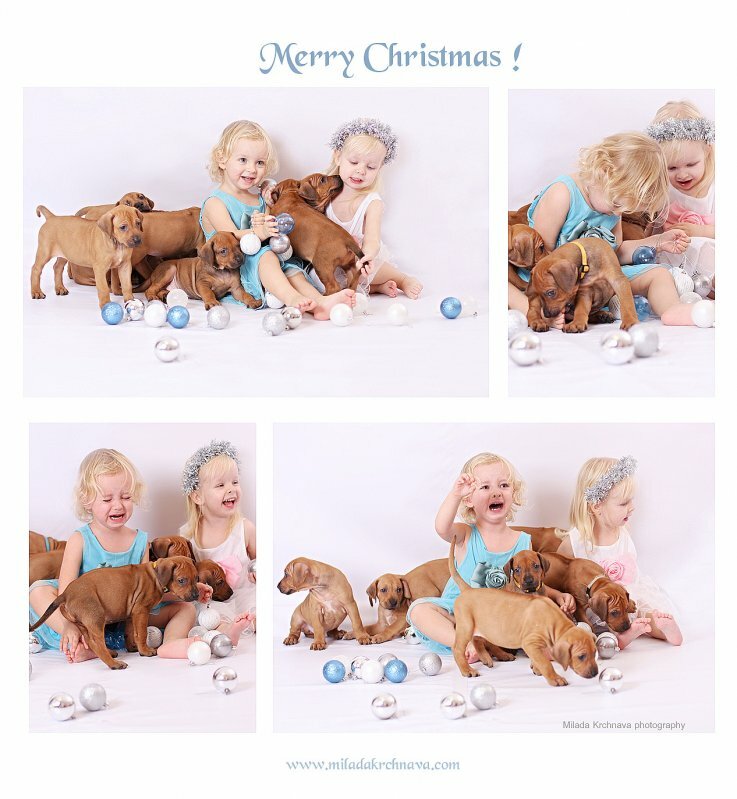 We had a Christmas photoshooting with our puppies -they are already 6weeks old - to see more photos click here :) ! Mali sme Vianočné fotenie s našimi už 6týždňovými šteniatkami. Viac foto TU! Our F-team start to learn many more things, and for the first time we were outside:) ... have a look at our 5weeks old photogallery :) . Naučili sme sa veľa novźcg vecí a prvý krát sme boli aj vonku :) - viď - fotogaléria 5týždeň . Some more photos of our lovely puppies ! 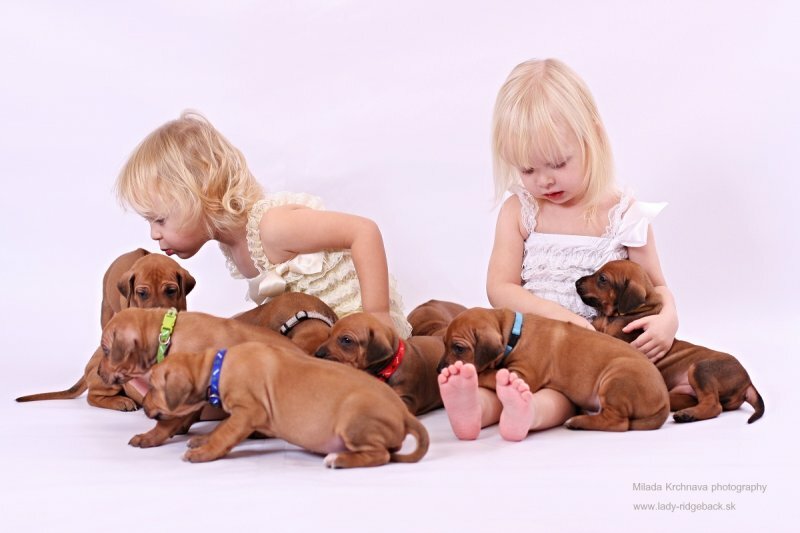 Our babies in stacked positions + portraits + ridges - AVAILABLE show Quality puppies! Naše šteniatka v postoji + portréty + ridge! Máme voľné šteniatka - píšte, volajte 0907 44 77 87! Ďakujem mojej drahej priateľke Miške Reitschmiedovej, ktorá mi moc pomohla pri tomto fotení <3. PHOTOS HERE */ * FOTKY TU! More photos of 3wks old babies here ... some of puppies AVAILABLE. Máme 3týždne. V puppy boxe okrem jedenia už pobehujeme a začíname sa navzájom okusavať a hrať spolu :). We are 2weeks old - all of us were for the first time dewormed. 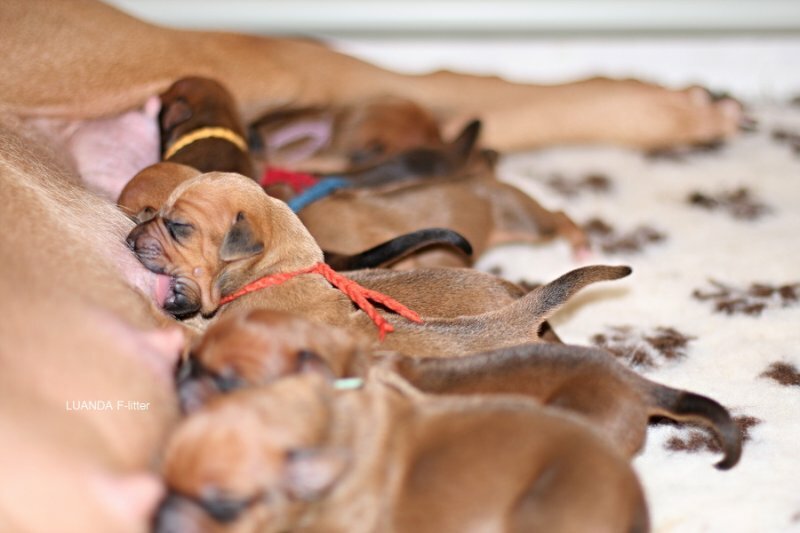 for more detailed photos of our wonderful F-litter click on the pict. bellow. Zoe - Norwegian Champion, Nordic Winner !!! Empress Zoe by Luanda Nordic winner, Norwegian Champion, BOS and CACIB. 13.11.2014 - LUANDA F-babies are here !!! She brought to the world very easily 9 gorgeous puppies, 4boys and 5girls. 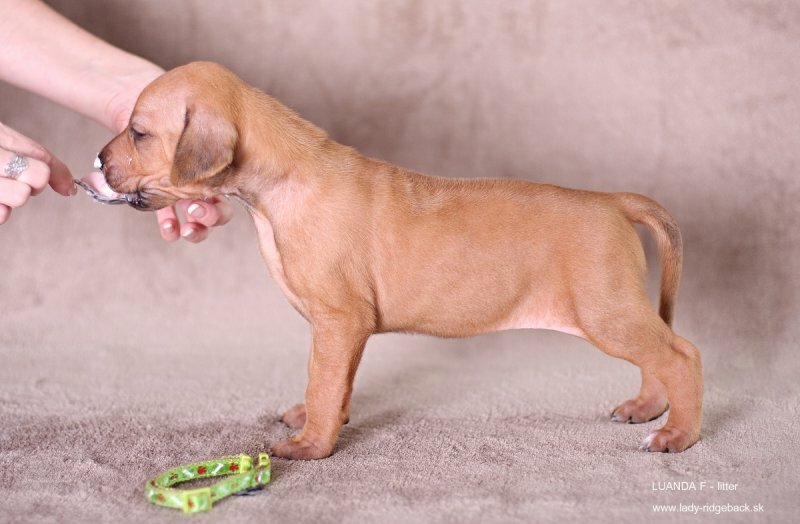 All puppies have correct ridges, minimum white, all correct expect one boy with a small kinked tail. We are extremly happy and over the moon! What a mom is our Yman! What an amazing litter she brought to the world!, Thank you my beloved girl! Lady & Becky -we miss you.... always in our hearts !!! My dear girls I never forget, I still love you and I still miss you so much !!! My dear friends / puppy owners, thank you all so much for presentation at EDS! I am so happy and proud of you all I.Kozicova &co. V. Vodzinsky & co. & Michaela Reitschnmiedova ! Zoe, Sunny and Zara - girls from our E-litter rocked again! Our amazing E-litter girls roocked show European rings again ! Evening Star of Luanda "Zara" - 2 x Excekkent 1 + 2 x CAC - at 2 x CACIB Komarom 11-12.10.2014 / Hungary !!! Escape to Hear by Luanda "Sunny" - 1 EXC CAC CACIB BOS / 11-10-2014 International dog show Bastia Umbra/ Italy !!! Empress Zoe By Luanda " Zoe" - cofirmed NORD UCH !!! Did I tell you I am proud of you my dears ;) ? Thank you so much !!! Zoe - CAC, CACIB, BOB, Winner 2014 - Danish champion !!! 16.09.2014 - Our queen Ani is 9 years old ! E- team girls rocked ring in Sweden and Italy again :) !!! BISS 2014 - Empress Zoe by Luanda - WON it all !!! Empress ZOE by Luanda - CAC,CACIB,BOB, Crufts 2015 qual. !!! Clayton my Hero by Luanda - winning at Washington/USA ! 24.04.2014 - Escape to Heart by Luanda -Exc 1 CC -Italy!